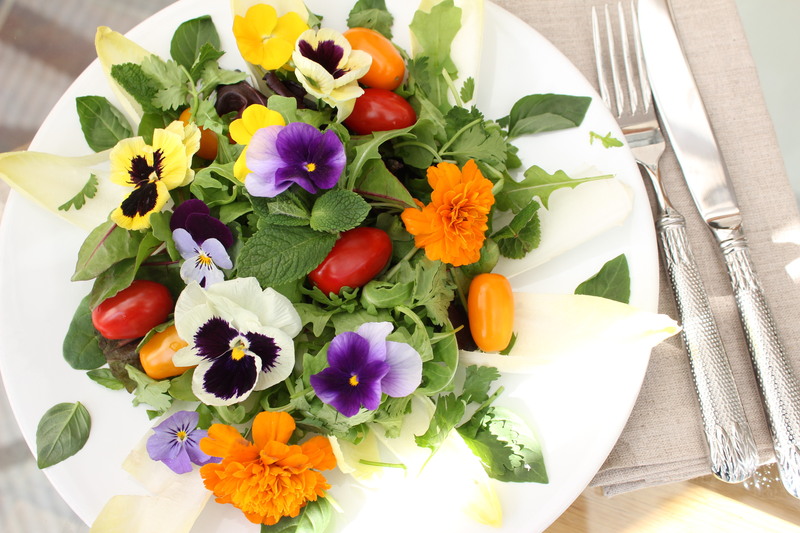 This is a light and refreshing salad that looks beautiful but is also delicious and will impress any guests. Combine vinegar & mustard in a bowl. Gradually whisk in oil, then season dressing with salt & freshly ground pepper. Toss dressing with greens & top with flowers. Serve immediately. The amalagamation of fresh herbs, greens & flowers provides a wonderful alkalizing dish, which supports your body in preparation for the summer season. Fresh mint is one of the highest antioxidant capacities of any food containing potassium, magnesium, calcium, phosphorus, vitamin A & C. Mint also contains rosmarinic acid, which has been studied fir its effectiveness in relieving seasonal allergy symptoms because of its anti-inflammatory properties. It’s also known for its calming & soothing properties, which are thought to improve the flow of bile through the stomach, which helps speed & ease digestion & support IBS. Basil is a highly fragrant herb, which contains flavonoids which protect your cells. Basil also has been shown to provide protection against unwanted bacterial growth. It’s also a good source of vitamin A, via its concentration of cardenoids such as beta-carotene, which protects against oxidizing cholesterol in the blood stream. Basil is also a good source of magnesium, which is essential mineral for over 300 functions in the body. It is also a great source of vitamin K & manganese, a very good source of copper & vitamin C, & a good source of calcium, iron, folate & omega-3 fatty acids which are known for there anti-inflammatory benefits. Coriander is a wonderful food for any skin inflammation, high cholesterol levels, diarrhea, anti-allergic properties, & so much more. Coriander delivers an array of healing phytonutrients & anti-oxidants, vitamins A, C, K & traces of B vitamins. It provides a high level of calcium, potassium, iron, manganese & sodium. Rocket which is also known as arugula belongs to the brassicaceae family which is rich in phytochemicals that have counter carcinogenic effects of estrogen, & helps protect against prostate, breast, cervical, colon & ovarian cancers because of cancer cell growth inhibition. Rocket is also a good source of folates, vitamins A, C & K. It also contains minerals such as copper& iron with small amounts of some other essential minerals & electrolytes such as calcium, iron, potassium, manganese & phosphorus. Research has confirmed purple radish mirogreens have significantly higher nutrient densities than mature leaves & help boost the satiety to any meal. They contain vitamins A, C & many of the B vitamins, iron, magnesium, calcium, phospherous, potassium, sodium, zinc, copper, manganese, & selenium. Fennel has a licorice-like flavour & offers dietary fibre, is a good source of potassium, sodium, vitamin A & C, calcium, iron, vitamins B6, & magnesium. As well as containing phosphorus, zinc, copper, manganese, selenium, niacin, pantothenic acid, folate, choline, beta-carotene, lutin, vitamins E & K.
Please note if you are currently on Beta-Blockers, a type of medication commonly prescribed for heart disease, do not consume fennel because it can cause potassium levels to increase in the blood. The marigolds botanical name are tagetes & they have a delicate flavour, but at the same time make a beautiful colourful garnish, really adding the wow factor. Along with the pansy which is botanically known as viola tricolour & has a lettuce like flavour. This salad contains botanical properties, which will naturally help support & ease the symptoms for any hay fever suffer.